Are you an adult that is interested in the Catholic faith? Perhaps you’re not familiar with Catholicism and just have questions. Or you may have been Catholic all your life and feel that you need to refresh basic knowledge of Catholic practices and traditions. Regardless of your motivation, the RCIA process just might be your answer. If you are a parent that is wanting your children to be baptized or to receive other sacraments, please should contact the parish office. The Right of Christian Initiation of Adults (RCIA) is the process by which adults are prepared to become Catholics. RCIA also serves as a focus for ongoing conversion for all members of the Catholic Community. Parishioners are encouraged to study their own faith as they support the candidates. Members have the opportunity to renew their baptismal commitments to Christ and His Church as they participate in ceremonies welcoming new members. Teams of parishioners share their faith experiences and present various topics. A sponsor of his or her choice individually supports each candidate. All sponsors must be practicing, baptized members of the parish community. The culmination of your adult faith formation allows you to fully participate in the Holy Sacraments of the Catholic Church. Weekly sessions are held and include a time to reflect on Sunday readings as well as a time of formation in the Catholic faith. It starts with the Period of Evangelization which allows candidates to ask questions and decide whether or not they wish to continue the process. The Catechumenate period follows and introduces the candidates to liturgy, faith-life, and service. The third period, called the Period of Purification and Enlightenment, covers the Season of Lent, special liturgical ceremonies, prayer and study. 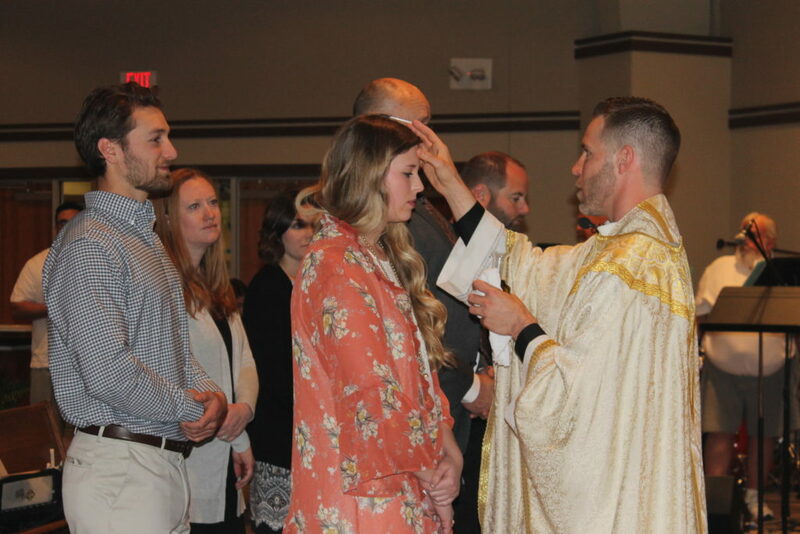 It climaxes at the Easter Vigil with the sacraments of Initiation -- Baptism, Confirmation and Eucharist. The final period, Mystagogy, is a time for ongoing catechesis and full participation in the Eucharistic celebration. If you are interested in this faith journey, contact Tracy King at tlking639@gmail.com or Kent Welch at welchkm4@aol.com.